Dream weaving, day night cycle and a lot more lore. 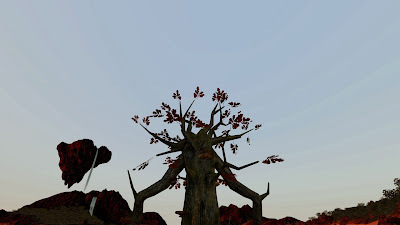 Beta 14 of Wander is now uploaded. There is a lot of new content in the latest build. We have a day/night cycle now so you can see the sun moving and work out when to find shelter. We also have some new voice actors, Kathy and Rebecca. Elaine has recorded a lot of new content from these two, written by our writer, Crystal. We're excited that the first initial version of the dream weaving is now live. As you learn more in Wander, you can imagine more things in the dreamscape. You enter a dream by being in a shelter when night starts. If you're in a shelter with other players you will be able to visit each others dreams. We've got big plans for the next month as well. Antony and Ralph are hard at work implementing Crystal's concepts for the new Hira (humanoid) characters and then they are getting to work on new Oren and Azertash characters, to join the Griffins we released last month. Sarah and Aaron are adding new content as always and our composer, Ben is going to be recording a lot of new music with a collection of amazing musicians. If you have an Oculus Rift and would like to see what Wander looks like with the Rift before you buy the beta, we've uploaded a video in Rift mode. To toggle Rift mode in Windows or Linux just hit the Pause/Break key. If you haven't yet voted for Wander on Steam Greenlight, we'd love your vote!